Our society increasingly depends on networked information systems, either explicitly, or invisibly, via networked embedded systems. The correct and efficient operation of these systems in terms of their performance and dependability (including security, safety and reliability), is crucially important. Performance and dependability prediction, testing, measurement, benchmarking and verification are critical aspects of the design and deployment of computing systems. 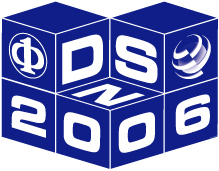 To advance the field, integrate theory and practice, and to exchange ideas and experiences, the Performance and Dependability Symposium (PDS) brings together academic and industrial researchers in computing systems analysis, measurement, testing, validation and verification. Manuscripts in the following categories will be refereed and considered for publication in the IEEE Proceedings of the 2005 International Conference on Dependable Systems and Networks (excessively long submissions, unoriginal work, or work that is submitted to multiple venues will be disregarded). Submit all materials through the PDS submission page as Portable Document Format (.pdf) files. Please preview the manuscript in a viewer such as Acrobat to ensure its integrity before submitting it. Make sure you visually check uncommon fonts, symbols, equations, etc. A defective print can undermine your chances of success. For those who are unable to submit materials electronically or cannot generate .pdf files, please contact the program chairs for special instructions.